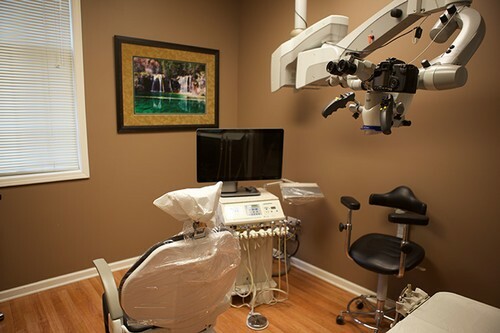 Your visit in our office will begin with a comprehensive consultation and examination. At that time, we will examine the area, take diagnostic films, decide whether your tooth is in need of root canal therapy, and review your treatment options. If root canal therapy is indicated, a local anesthetic is used. We will remove the nerve and bacteria from your tooth, clean the infection and seal the roots of the tooth. You will have no pain during this procedure. It can usually be completed in one to two visits depending on the required treatment. Most patients return to their normal daily routine after treatment. After treatment is completed you will need to see your general dentist within one month for a final restoration. A treatment report will be sent to their office. You will be given Ibuprofen to aid post-operative healing and to help manage any discomfort. It is an anti-inflammatory pain medication that will reduce the inflammation in the area that was treated. If the Ibuprofen does not alleviate your symptoms, please call the office and let us know. A very small percentage of patients (less than 5%) experience post-operative swelling in the area that was treated. If this happens, please call our office immediately to speak with the doctor. If you have any questions or concerns following your treatment, please do not hesitate to call our office. If your call is after office hours or on the weekend, the doctors cell phone number will be available.